beautiful Nell! Extremely beautiful work! Very nice! There should be more wallpapers dedicated to Nell! beautiful Nell! Very nice pic, thanks. Wow This is pretty! Grrrr! by now I know that Nel dousen't stay chibi, even though i'm not there in the anime yet and i'm way behind in the manga. Thank you for the beautiful wall of her though. I agree she is one of the prettiest girls in Bleach. I don't see much of Nelliel's wallpapers and I thank you for making this. She's my second favorite girl in Bleach (Orihime-chan being the first) and she absolutely looks beautiful in your wall. You did one amazing job here. amazing wallpaper :O creepy girl :O hehe XD congratulations and thanks for share it :D favorite :D and..................... HAPPY NEW YEAR 2011 TO ALL OF YOU :D YEAAAAHHHH! 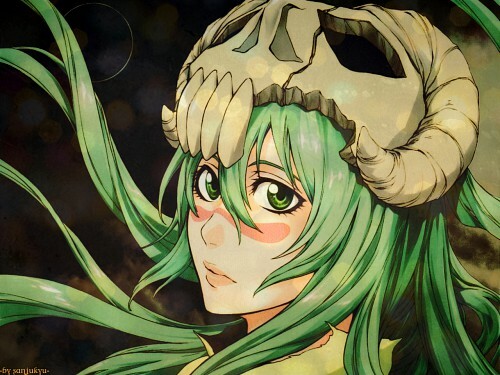 This is such a beautiful wallpaper of Nelliel-san! I love the colors here and the shadings have blended in well, along with the effects. OMG! This is so cool! I love this, the expression on her face and her hair and everything! Lovely. nice art work thanks for share! Very nice,.I like it very much! she's soooo pretty here.. where did you get this scan..
beautiful Nell! thanks for share!